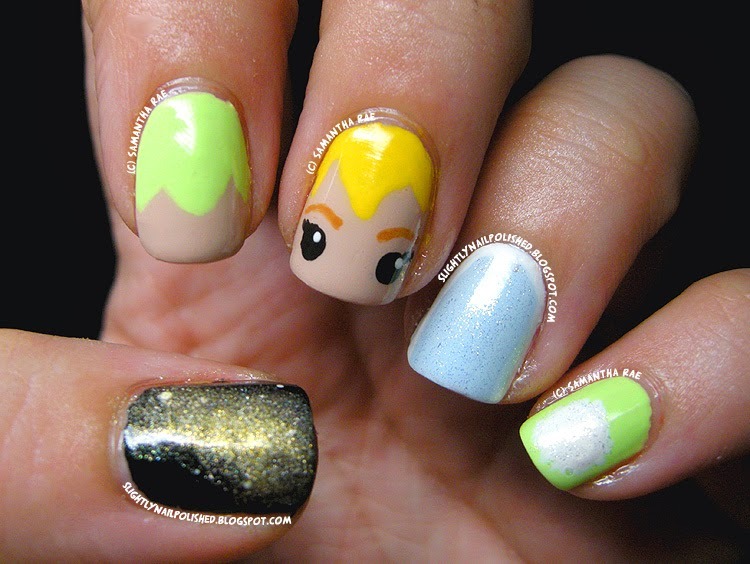 Slightly Nail Polished: Disney's Peter Pan and Tinkerbell! Disney's Peter Pan and Tinkerbell! Disney fan alert! Went on a trip to Disneyland a few weeks ago and decided to do a look inspired by one of my all-time favorite Disney movies, Peter Pan. Now, before I go on, I have to give a huge shout out to IHaveACupcake as her Peter Pan video is the inspiration for this look. And when I say 'inspiration', I really mean that I duplicated her look on one of my hands, then too Cupcake's style and painted Tink on the other! 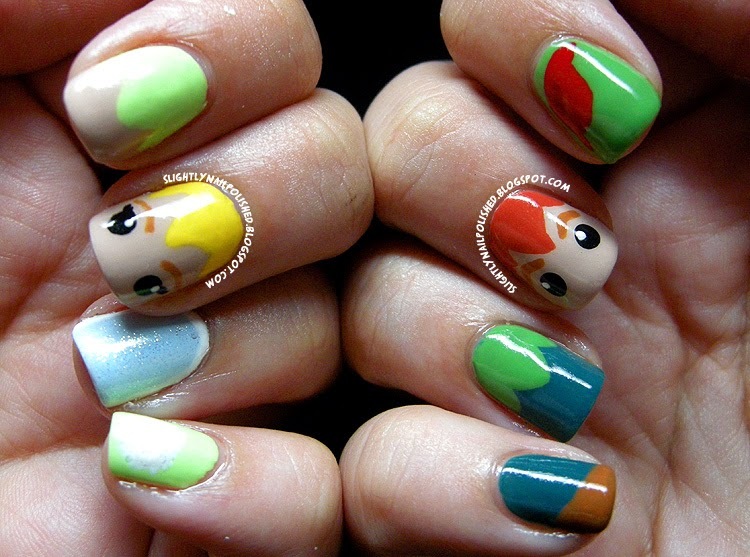 Obviously, this is the hand I duplicated from IHaveACupcake's video. 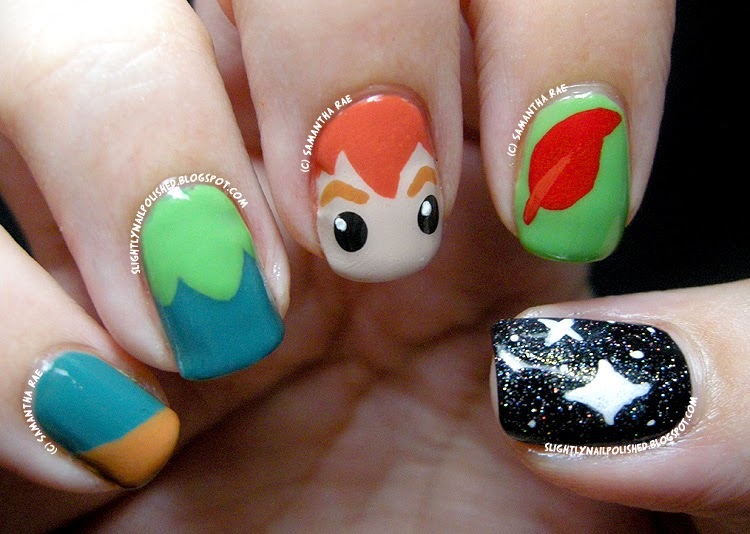 Only instead of doing a tiny Tinkerbell on the thumb, I opted for his map home to Neverland, The Second Star To The Right. And here is the hand inspired by her tutorial. I have Tink's face, her cute dress, adorable pom-pom shoes, blue iridescent wings and a touch of pixie dust on the thumb! And for painting her face with my non-dominant hand, I think she turned out rather good. 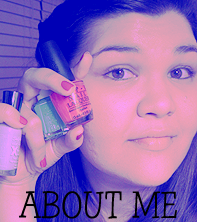 I used mostly nail polishes, which I listed below as per usual. I think the only acrylic paint I used was white, black and yellow but I could be wrong. I had a ton of fun doing this. I'm a huge fan of the Peter Pan universe in general so doing this look was something on my wishlist to do. And it turning out so cute was just the icing on the cake! I really hope you like this as much as I do. Thanks for reading!